One of the reasons Lotus Weddings is considered the Best Village Club of Sands Point Wedding Photographers is because we truly care about telling your story in a unique and modern way. There are a million stories to be told on any given wedding day, and when you look at your wedding album 10 years from now, I want you to be instantly taken back to that day at The Village Club of Sands Point. I want you to look back and see all of the Modern and Artistic Wedding Photos we captured for you and still be in awe. When you see a candid photo of your husband seeing you, his wife for the first time in your wedding dress, walking down the isle, I want you to feel his emotions. That is why Lotus is considered the best Village Club of Sands Point wedding photographers. We truly care about you and your wedding photos and video. 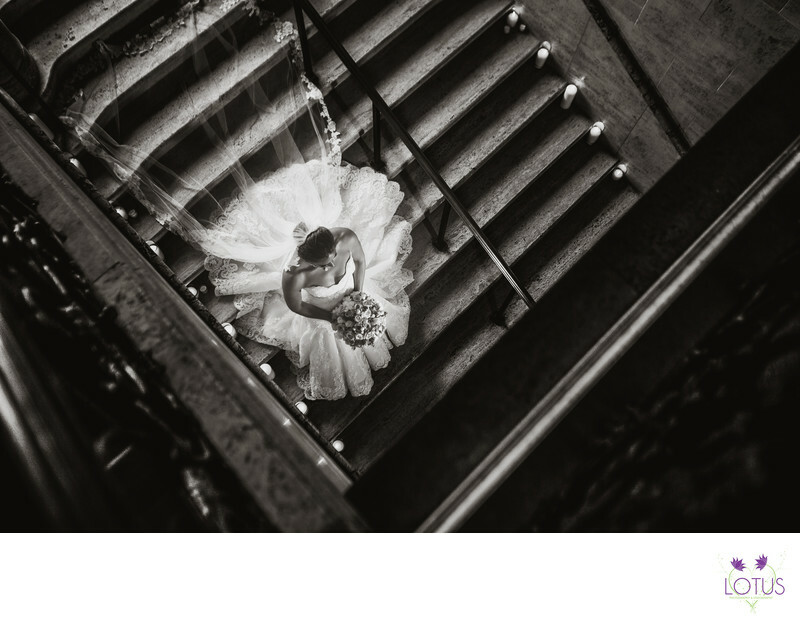 This creative and candid black and white wedding photo of the bride walking down the stairs with her bouquet in hand and her veil flowing gracefully behind her was taken on the inside staircase at the Village Club of Sands Point. Location: 1 Thayer Ln, Sands Point, NY 11050.